Windows version pre-configured with nGlide. Mac version instead uses DOSBox. The GOG.com Windows release does not include the original desktop icon. A replacement can be found here. In addition to being released in various languages and for various graphics chipsets and APIs, certain versions of the game were censored, changing the green alien blood to blue and removing head shots. Unfortunately, no official list documenting which versions were censored was ever released, although the GOG release is uncensored. MDK.EXE - MDK DOS executable. DOS4GW.EXE - DOS protected-mode extender (provide full amount of system RAM, above first megabyte to software). Can be replaced with DOS32A. HMIDET.386 and HMIDRV.386 - drivers from HMI sound API that detect your souncard and give access to "digital" (aka PCM) sound capability of the sound card. Copy all files to game's root directory. Rename existing MDK.EXE to MDK95.EXE to avoid being overwritten. Use the parameter -iamapirate to bypass the CD check (also works on windows version). M.D.K - DOS net update ver. M.D.K - W95 net update ver. M.D.K - 3Dfx net update ver. M.D.K - Direct3D net update ver. M.D.K - PowerVR 3D net update ver. M.D.K - Rendition Redline 3D net update ver. M.D.K - W95 / Force Feedback net update ver. M.D.K - Direct3D / Force Feedback net update ver. M.D.K - W95 A3D sound patch off net. M.D.K - Direct3D A3D sound patch off net. Open the saved file with the Universal Game Cracker to force disable CD check. Defaults to 600x360 windowboxed to 640x480. See Widescreen resolution. Use DXWnd for Windows; for DOSBox toggle with Alt+↵ Enter. Use a glide wrapper then force in control panel. Some wrappers provide this option builtin. Use nGlide (see Widescreen resolution). Frame rate is capped at 30 FPS. Cap can be forcibly disabled using the -nosync parameter, though this breaks physics and jumping. Higher resolutions can be used (stretched/pillarboxed 4:3 only). Install nGlide for versions other than GOG.com (the GOG.com version already includes it). Run nGlide from the Start screen/Start menu. 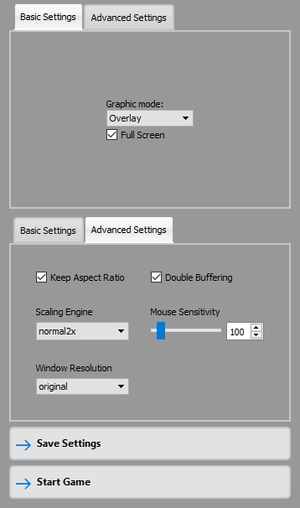 Set the resolution and aspect ratio preference (4:3 for pillarboxed, fit to screen for stretching from 4:3). Run the game in 3dfx mode (MDK3DFX.EXE). Download Idarion's widescreen fix for Beyond Good and Evil. Download nGlide 0.97 (other versions cause graphical glitches). Put the files inside of the nGlide 0.97 into the installation folder. Set Aspect ratio to "Fit to screen" (the BGE fix expects image that is horizontally stretched). Paste the files from the BGE widescreen fix into the installation folder. Edit d3d9.ini and make sure bPillarBox16to9=false or else it won't work. 16:9 resolutions works the best - no bars on top and bottom and only small bars on the sides. 16:10 resolutions - small bars on top and bottom, but still better than without the fix. Only first 4 mouse buttons can be bound. Special version for the Sidewinder Force Feedback Pro was available. Sidewinder Force Feedback Pro only, requires special patch. Open MDK.CFG (or create it if it doesn't exsist). The controls for the flying sections gets switched around. Alt+Tab ↹ disabled in software rendered version. A3D 1.x was added with a patch. The D3D version can be found here although the software (Win95) version is not available on the net. See Widescreen resolution. Use Alyxx's fan patch for Steam version. A wrapper to emulate older graphics cards, such as dgvoodoo, may be necessary to avoid missing or corrupt textures. Use the MDKD3D exe to launch the game. Special versions for the Rendition Redline was also available. PowerVR only (MiniGL). Use the MDKPVR exe to launch the game. Requires wrapper, such as nGlide, to work on modern systems. 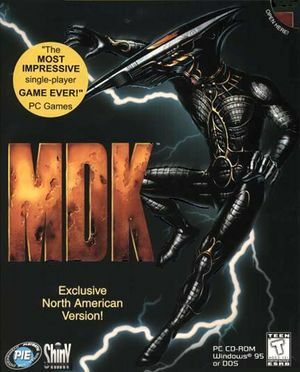 Use the MDK3DFX exe to launch the game. Lauch with the MDK95 exe. The MDK exe is only for DOS mode. Renamed to MDK_soft in digital release. SVGA Use the MDK exe to run in DOS mode, others are Windows only. Can be forced to run on a 486 using the -486okbyme parameter. Recommend also using the -iam486 parameter (reduces detail). ↑ 2.0 2.1 File/folder structure within this directory reflects the path(s) listed for Windows and/or Steam game data (use Wine regedit to access Windows registry paths). Games with Steam Cloud support may store data in ~/.steam/steam/userdata/<user-id>/38450/ in addition to or instead of this directory. The app ID (38450) may differ in some cases. Treat backslashes as forward slashes. See the glossary page for details. This page was last edited on 5 March 2019, at 00:39.